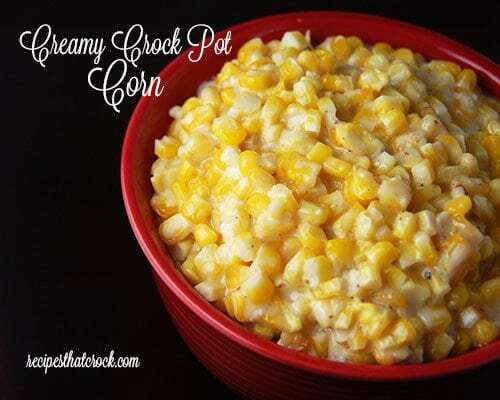 Creamy Crock Pot Corn - Recipes That Crock! 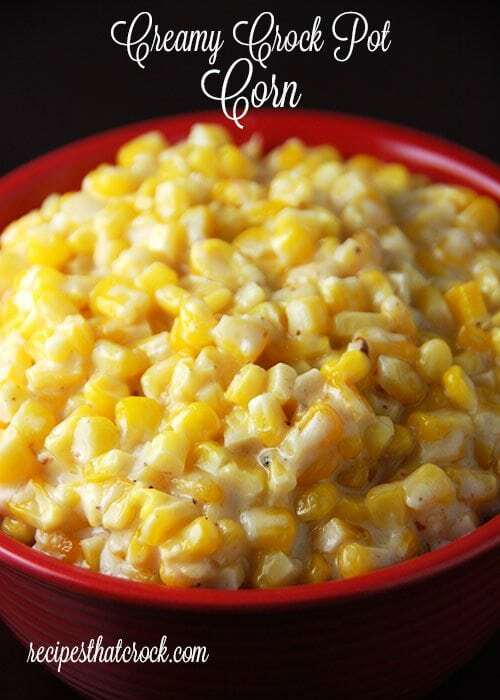 Creamy Crock Pot Corn is THE BEST corn side dish and so simple to make! 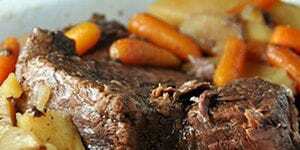 The slow cooker does all the work. 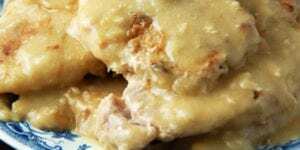 Perfect for the holidays, potlucks, picnics or a treat for a weeknight meal. Not a fan of cream corn? 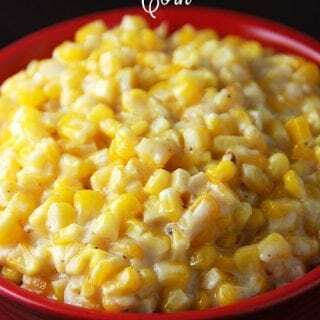 Don’t let the name fool you…this Creamy Crock Pot Corn from Gooseberry Patch’s Grilling and Campfires Cooking is not your average cream corn! Michael has a real bad habit of not telling me that he doesn’t like something until I have already made it. I made up a dish one night and asked him before hand if that sounded good. Well, he didn’t tell me that he didn’t like that particular meal, so I was a bit surprised when he didn’t like it. Then he tells me that he just doesn’t like that dish period. I just shook my head and went on. When he tried this corn and said, “Wow! This is really good! And I don’t even like cream corn!” I just shook my head again. Gotta love ’em! The recipe said it would serve 8-10, so I cut it in half for us. 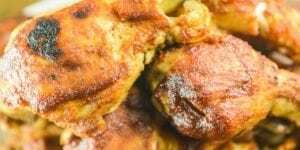 However, Mommy, Daddy and Ryder LOVED this recipe. I definitely didn’t need to cut it in half! My little guy wanted more and more and more! 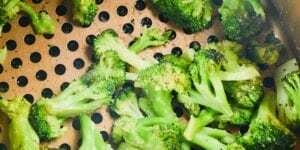 When your toddler wants to eat his veggies, you remember that recipe! 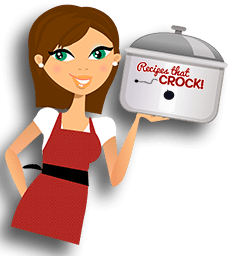 Place your corn in your crock pot. Cut your butter into slices or cubes and add to your crock pot. 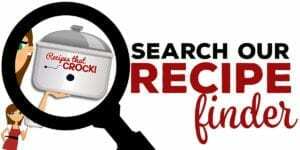 Cut your cream cheese into cubes and add to your crock pot. Add your salt, pepper and sugar. Stir everything together and cover. Cook on low for four hours or high for two. Stir at least once halfway through. 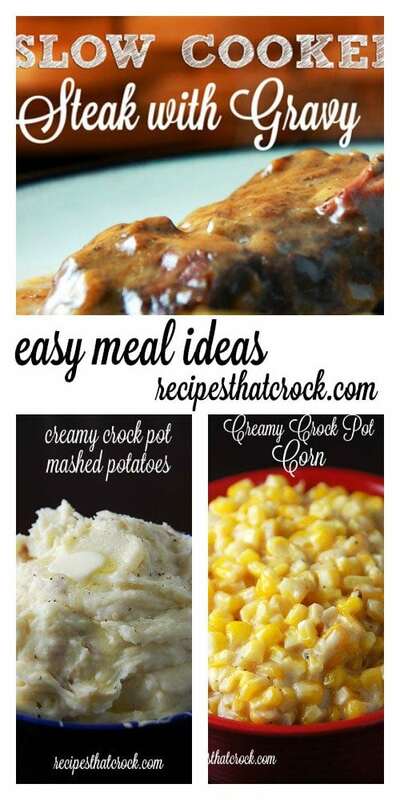 You will love this Creamy Crock Pot Corn with some Slow Cooker Steak with Gravy and Creamy Crock Pot Mashed Potatoes. Yum! We thought it was pretty good, but there were several hard pieces of corn even after being cooked on low. Any solutions?? I am not sure why there would be hard pieces. Did you use a brand of corn you have used before with no problems? We had great success with Kroger brand frozen corn. You might give it a try with Kroger corn if you have a Kroger, Jay-C or Ruler in your area. Looking forward to making this for a BBQ tomorrow! 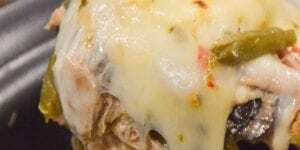 I want to use fresh corn on the cob and I was thinking I could shave it and put it in raw to cook. Do you think same amount of ounces? Yes, same amount of corn. You might want to add a little bit of liquid since the freezer corn would have a bit of liquid in it. Let me know how it goes! Enjoy! It is two of the 12oz pkgs of frozen corn. Enjoy! is it 2 pkgs of corn – 12 oz total. or 2 x 12 oz pkgs – 24 oz total?